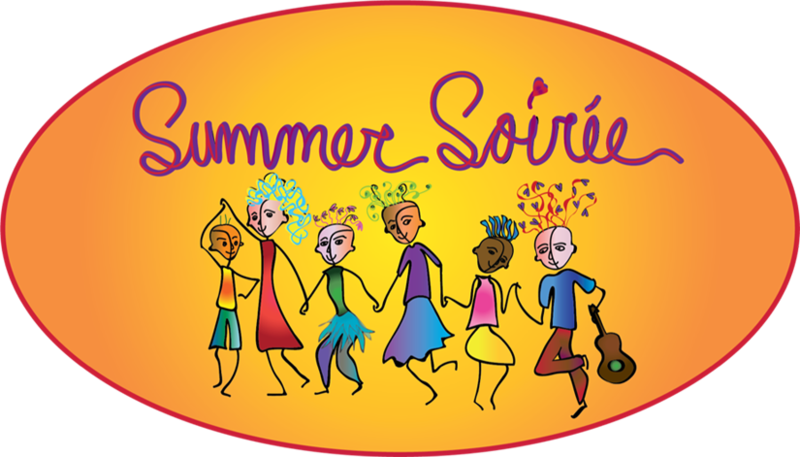 Summer Soirée 2019 will be June 21-23! The line up this year promises to offer you non-stop amazing dances! Okay, maybe not non-stop, but with Elixir and Gaslight Tinkers, it should be a stellar Soirée! Expect six hours of live waltz music, as always, a program full of workshops. We're planning some late night blues and with Emily Rush as a caller you know there will have to be Rush Fest!! More will be revealed ... if you haven't joined aleady, please join our Friends of Summer Soirée Facebook Page. "Burning Man" of Contradance Weekends! SPECIAL REGISTRATION FOR THOSE WHO CAN'T USUALLY GET IN! We have a few tickets set aside for dancers who have never attended or who haven't attended in the last 3 or so years. So many dancers have been frustrated by how hard it has been to register - (some years tickets are gone in 15 minutes - though it is usually a few hours) and so they stopped trying! If you fit this category, please and let me try to get you in this year! To be up to date on Soirée, please join the Facebook Group, Friends of Summer Soirée -- all news is generally released there first! But if you're not on Facebook or want to be sure to get all the news, sign up for the newsletter below. You will not get any newsletters that are related to ANYTHING but Summer Soirée and I will never share your email with anyone! An example of the schedule from past years will give you an idea of our general lineup! Schedule and details for 2018 here: Weekend Schedule and Details of What to Bring. Facebook Event Page. There are lots of videos and photos posted there! If it gets any better than this, please tell me about it - we will try and make it better. Gender Balance? Nope! No role balancing either! Facebook Page for The Earliest Updates. We send out Soirée Related Newsletters only, no more than 2-3 times a year. Summer Soirée holds the safety of dancers to be paramount. Unfortunately, to preserve the protection of the younger women Summer Soirée has severed all ties to Jordy Williams. He is no longer part of the weekend and will not be welcome. This is not the first time Soirée has had to ban a dancer, but because Jordy has been a part of the dance - running the late night technos, for example - it feels imperative that a public statement was made. "I enjoyed all of the experienced dancers. There were tons of wonderful people of all ages who were incredibly fun to dance with and helped me to become a better dancer. I also loved the atmosphere of Warren Wilson and how quiet and peaceful it was. The bands had amazing energy and made the dance floor light up!" Michael Spatzer, new dancer 2018, Atlanta, Ga.
"The atmosphere was so welcoming and positive. I so enjoyed the quality of the music and expertise of our callers. Our accommodations were nice and quality of foods provided were excellent. The decorations were colorful and fun. Enjoyed the gazebo setting for workshops and content. Very informative workshops!" Carol James, 2018. "The energy of the bands and the dancers was incredible. It was a real "dance-trance" experience and not to be missed." Gwynn Williams, U.K., 2018. "Everyone was so friendly, there was a feeling of community. My first time at the Soirée and I had a blast!" Natalie Clevenger, Black Mountain, NC, 2018. "The waltzing. The contra was great and I really enjoyed it but the waltzing was even better. 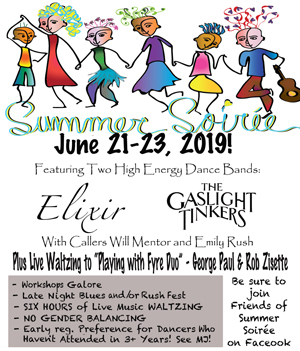 Summer Soirée does a better job of providing waltzing than any other contra dance weekend I can remember and the pavilion is a spectacular place to waltz." Bill Sax of Boone, NC when asked what he liked best about Summer Soirée 2018. There are SO MANY things I love about Soiree. 1) The music is hot and fast and fun 2) the dancers are great 2b) the dancers are considerate 3) people are friendly and welcoming 4) it's awesome to be able to sleep on campus and eat on campus and dance on campus, it's all right there 5) plenty of waltzing, hooray! 6) good food for meals and snacks at all the necessary times 7) hugs from MJ 8) air conditioning in the dorms 9) did I mention the awesome dancing and amazing music?!? Sara, of 2018. "Dear MJ, what a wonderful event, every year it seems the best ever. Bands were incredible, callers were incredible, organization was incredible, and oh the weather! And the full moon! Thank you so much for all your hard work, and the work of all who helped you make it happen. Homage, and congrats!" James Morgan, Carrboro, NC. "Congratulations MJ Taylor for organizing/guiding another fabulous dance experience. You are to be commended for having consistently good music over the years and your ability to attract the skilled, high-energy dancers to match the dynamic musicianship. And, there certainly was enough dancing opportunities offered." Warren Doyle, organizer of Contradancers Holiday Delight. "Best dance camp I've been to in 15 years." Tom Bowers of California who attended Soirée for the first time in 2015. "My face hurts from smiling so much. Words cannot accurately describe the joy I felt this weekend. There were numerous moments where I felt this weird lovely incredible natural high. Just a state of pure happiness. You created that magical world for a weekend, and I can't thank you enough. Thank you thank you thank you!!!! It was incredible... Great dancers. Great musicians. Really- it was all I could do to keep my eyes from rolling back into my head I was so caught up in that music, movement, community, aerobic twirly trusting joyful dancing. You can see it in the pictures and videos. People are just beaming. Loved every minute of it. Thank you!" Chrissie Chapman. ""I'm a complainer, and I had nothing to complain about." ~ Debra Kirsch, DC area. Location and lodging: Summer Soirée is held at Warren Wilson College, just outside Asheville, NC. The college campus is one of the lovliest settings in the area. Dancers from out of town have the option of staying in the college dorms for $65 for two nights, shared room. A single room is available for $130. The largest dorm is air conditioned and most dancers are housed there. Out of town dancers may also find reasonably priced hotels within a couple of miles of campus. Many Soirée dancers stretch their weekend into a 5 day festival, arriving early to dance at the Old Farmer's Ball on Thursday night and staying over for the Monday Night Dance in West Asheville. The Soirée bands often play at least one of those dates. 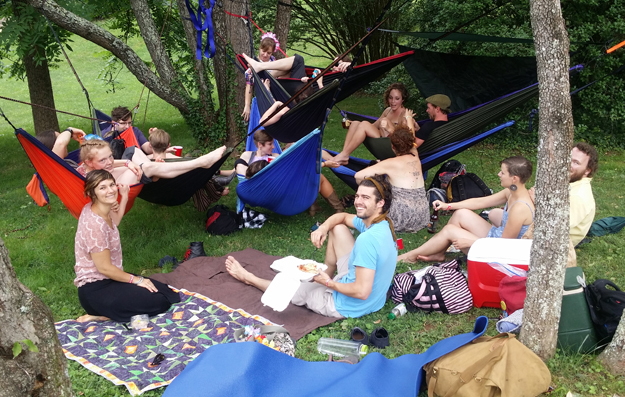 It's not all dance, dance, dance; there is relaxing and sharing snacks on the Grassy Knoll above the Pavilion. Bring a blanket or hammock and join in the lazy moments, too. Some fun from previous years: some extraordinary photos by Kevin Riggs and videos by John Newsome. Here's my favorite techno contra video from John. Eden MacAdam-Somer Singswith Notorious & Cis on Friday Night.